TweetCaption is a small screen integrated into the museum signage system, which displays live Twitter messages filtered according to the exhibit: showing ongoing global discussions about the art piece, the artist, or contextual relevant information. TweetCaption allows visitors to draw parallels between the exhibition pieces and underlying discussions of the context the piece is dealing with. While traditional captions provide curated and authoritative explanation and interpretation for museum pieces, TweetCaption opens up the possibility to set exhibits in an on-going context of public understanding, connotations and current developments in filtering and displaying relevant Tweets from the Social Media tool Twitter.com. Consisting of an iPod Touch running custom made software, TweetCaption can easily be integrated into existing signage infrastructures. TweetCaption allows visitors a new form of interaction and participation in the museum with the exhibits they are looking at: they can scroll through thematically related Tweets and messages left by earlier visitors, as well as leave a message themselves. Also for museum professionals TweetCaption can provide an interesting perspective: as visitors sending their contribution to TweetCaption use a specific hashtag/code, museum authorities can have a focused look at their visitor’s reactions. 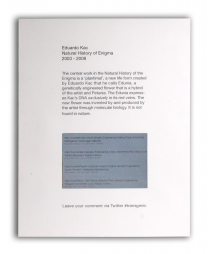 Using a hashtag specific to the museum as well as the objects, in sending a message user simultaneously inform their Twitter friends about the museum visit and their opinion.